Children spend a large portion of their days in school or childcare. As a result, the food they eat and the amount of physical activity they engage in affects their overall health. Through this topic, partners and strategies for improving the food and activity environment in schools are identified. Mandatory active recess and supporting implementation of new school food standards are a key focus. 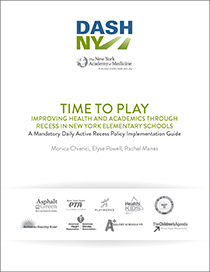 Learn how to improve health and academics through recess with the DASH-NY Mandatory Daily Active Recess Policy Implementation Guide. Anyone can be a recess advocate but implementing mandatory daily active recess is a collaborative process that engages many stakeholders from both within and outside of the school. This guide was produced as an informational resource for parents, teachers, school officials, and physical activity advocates interested in improving physical activity among students in grades K-5. Anyone can be an active recess advocate! Previous successes with mandatory daily active recess have shown that advocates can be school officials, parents, community organizations, and local government officials. 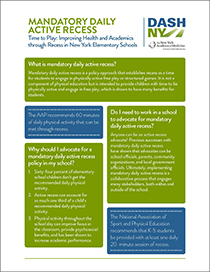 Ultimately, implementing mandatory daily active recess is a collaborative process that engages many stakeholders, both within and outside of the school. 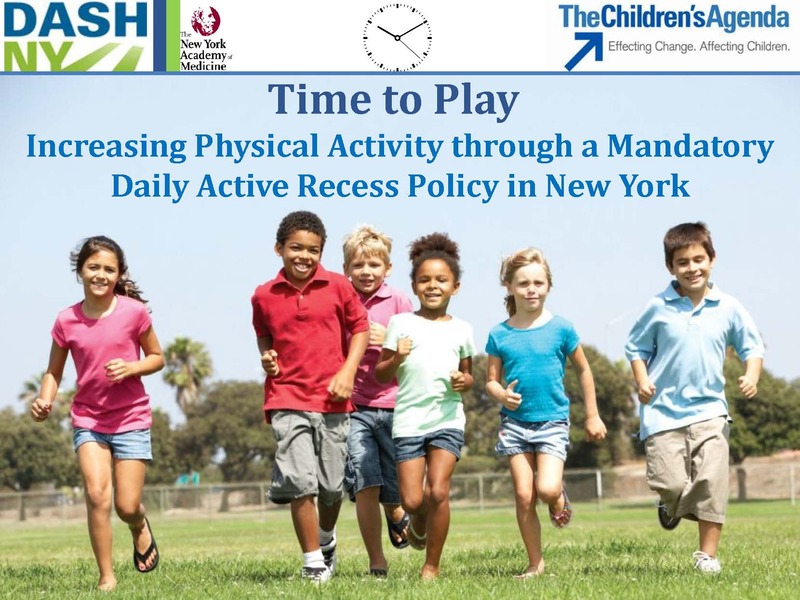 The Physical Activity through a Mandatory Daily Active Recess Policy in New York PDF presentation presents an introduction to the DASH-NY publication, Time to Play: Mandatory Daily Active Recess Policy Implementation Guide. DASH-NY’s Breastfeeding Fact Sheet focuses on Breast Feeding, one of the NYS Department of Health’s four priority strategies for preventing chronic disease. It can be used as a tool to support the development and implementation of local Community Health Improvement Plans and community Service Plans.